An evolution in mixed martial arts is happening right before our eyes, as athletes begin to absorb, master and execute techniques from a very wide variety of disciplines and fighting styles. Fighters are striking differently, moving differently, training and eating differently. What was dominant a year ago is already being countered and in some cases phased out. The more innovation we see, the faster the evolution goes. It’s a train with no brakes. One of the disciplines gaining a bit of traction in the MMA world is Savate, the French kickboxing art developed during the 1800s as self-defense for those engaged with the wilder side of society. 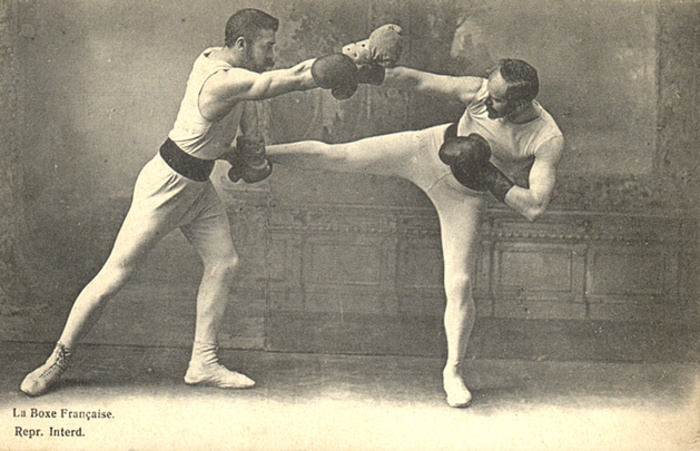 The word savate comes from an old French word for boot, a bastardization of the Spanish word zapato. Savate as it is known today is a mixture of southern kicking styles out of Marseilles, ostensibly used by sailors to fight on boats, and street fighting techniques in Paris and northern France developed by or for the more martial members of the upper class, who wanted to protect themselves when venturing into the Parisian red light districts to gamble and party. The southern kicking art was known as chausson, or slipper, while the northern style was called savate. 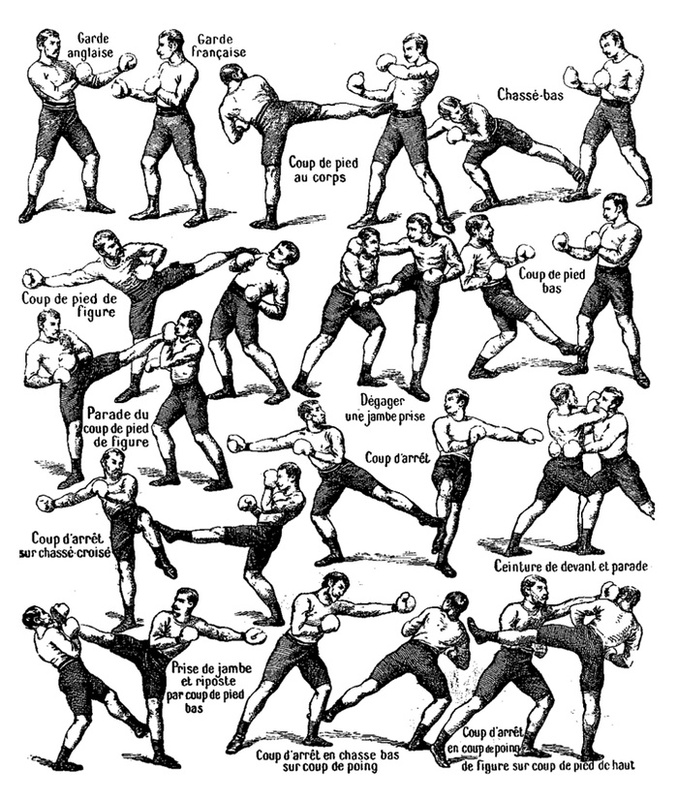 A series of masters in the late 1800s and early 1900s codified and organized the two loose fighting styles into a martial art and, eventually, a sport: la boxe française. The original two progenitors of the sport were Michel Casseux and his student Charles Lecour. Casseux is widely credit for creating the art of Savate out of the proto-jelly of French street fighter skills, while Lecour took his master’s art and added elements of English boxing to round out the striking skills. Lecour’s student, Joseph Charlemont, continued to develop the art into a professional sport, distinguishing it from the self-defense techniques used on the streets (Savate du Rue) and teasing out the cane and baton fighting methods into separate, related systems. Charlemont’s son, Charles, continued the tradition of fighting Englishmen and developing the art of French kickboxing until Charles’ student, Count Pierre Baruzy, established the Committee National de Boxe Francaise just before WWI. The sportification of the street fighter was complete. Since then Savate has taken baby steps toward eventual Olympic recognition, the Holy Grail for all self-respecting combat arts. A short discussion on this Reddit post highlights the potential of mixing Muay Thai’s powerful kicks and checks with Savate’s footwork, pinpoint side kicks and oblique kicks. In this training video, Professor Armando Basuto exaggerates chambering the knee to show how Savate’s many kicks can all start from that loaded position. That high chambering hides the true strike from an opponent, so a master can land flush repeatedly against someone unfamiliar with the art, like Pennacchio did against Dekkers in their match. Conor McGregor seems to have brought a bit of Savate into his arsenal of strikes, using the oblique kick to annoy Jose Aldo just seconds before he landed that neat hook to the jaw. McGregor uses the bladed stance, a more Eastern traditional stance, so it’s likely he also took that kick from Chinese, Japanese, or Korean martial arts—depending on what he studies—for that same strike is a common one in those arts. The oblique kick is not exclusive to Savate and it does not define the style. The strike may find itself into more MMA training regimes, but the essence of the art is not that strike, but the graceful footwork and movement that allows Savate fighters to pull that kick off as quickly and as effectively as they do. In time, fighters will evolve even past McGregor’s mixed style and develop even more complex and fluid fusion of the many fighting techniques out there. The evolution is moving so fast, we’ll probably be able to chronicle it here as it happens.